At the heart of Nordic design philosophy is a deep respect for functionality, clean lines, and longevity. The term itself conjures an airy imagery of white walls, neutral-coloured furniture, and minimalist decor. 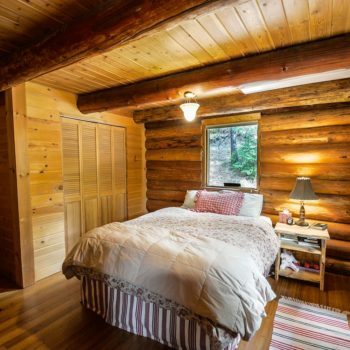 Natural materials, such as wood, complete the style of uncluttered corners, where homeowners can focus on authentic simplicity with a little rustic edge. Nordic design is created to be at harmony with its environment. Its ethos is a direct result of the natural gifts and the climate of the region. During the long periods of winter, homemakers counter the cold nights by maximising the space to reflect as much light as possible. In this time of the year, families spend a great deal of time indoors, where they lavish each other with positive energy to create a cozy atmosphere. This, perhaps, has become the foundation for many known Nordic lifestyle rituals, such as the Danish concept of hygge, the simple practice of acknowledging a special feeling or moment. The little use of furniture was not purely for the sake of aesthetics. Minimalism has pervaded Nordic design to allow light and air to move around the room at liberty. The Nordics also believe that things bought or made must be made to last instead of being regularly replaced. Admirably unencumbered, Nordic design makes use of materials formed in classic shapes that will go well with every season of one’s life. Nordic design has existed long before it was globally known. It perhaps budded in 1915, when a Danish company for decorative arts launched the magazine Skønvirke, literally translated as “Graceful Work,” to promote the local craftsmanship. This was made to rival a more famous art movement, Art Noveau – which was, in that era, exclusive to the rich and elite. 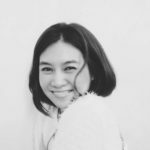 During this era, social commentary pressed more on the arts, which then paved the way for emerging designers to showcase a more accessible alternative. This new concept was called Art Deco – an industrially-driven design philosophy where Nordic design must have taken a page. In the 1930s, artists including Alvar Aalto, Borge Mogensen, Verner Panton and Maija Isola came together in what was then called the “Golden Age of Scandinavian Design.” Inspired by the concepts of Constructivism, Functionalism, and Surrealism, they paved the way to what would be Nordic design’s iconic milestones; even today, the design world still celebrates Verner Panton’s bright red Panton Chair, Marimekko’s bold floral prints, Arne Jacobsen’s Egg, and Michael Bang’s Holmegaard Palet Storage Jars. It was not until the 1950s that the world truly had a glimpse of what Nordic design has to offer. The Lunning Prize – a European equivalent of Nobel Prize – hailed exemplary designers who have given valuable contributions to Nordic Design from 1951 to 1970. This resounded the call for contributions locally and abroad. In 1954, Elizabeth Gordon, a tastemaker who championed the local design scene, arranged Design in Scandinavia – a traveling exhibition comprised of the region’s best designs. This exhibit led to the coining of “Scandinavian Design,” as the tour lands in the United States and Canada. In return, Nordic design has influenced the American culture, where traces of this aesthetic are visible in many of key cities’ present-day architecture. But Nordic design is not just one solitary concept. The Nordic region, made up of countries Denmark, Finland, Norway Iceland, and Sweden, is an umbrella of various tastes and influences inspired by each region. In Denmark, Danish design thrived during the 1940s to the 1960s, easing out from mid-century modern design to create its own flavor. It picked up its pace after World War I, where Danish designers abandoned grandeur ornamentation in the pursuit of form and function. After World War II, Danish design has become a democratic movement, where makers turn to mass producing natural raw materials – ceramics, wood, and leather – to provide comfort to every home. While the popularity of this philosophy lost its glow in the 1970s, people reveled in the rebirth of Danish design a decade after – the Danish Modern – thanks to the contribution of the likes of Hans Wegner, Finn Juhl, and Arne Jacobsen. In Finland, where the bold patterns of Marimekko were born, colors and soft textiles pervade the Nordic themed homes. Finnish design has been promoted since the late 1870s, gaining much popularity in the 1950s when the world finally set its gaze on the region’s local crafts. Intriguing ceramics, impressive glassware, and charming fabric prints pervade this design, with the names Alvar Aalto, Mija Isola, Sanna Annuka attached to its prime list of makers. Like most of its Nordic neighbors, Finland is wholly reverent to the natural world and Finnish design reflects their talent for gracefully integrating nature’s designs into their everyday life. Finnish glass design. Top: Aalto Vase by Alvar Aalto (photo by Gabriel Jordy). 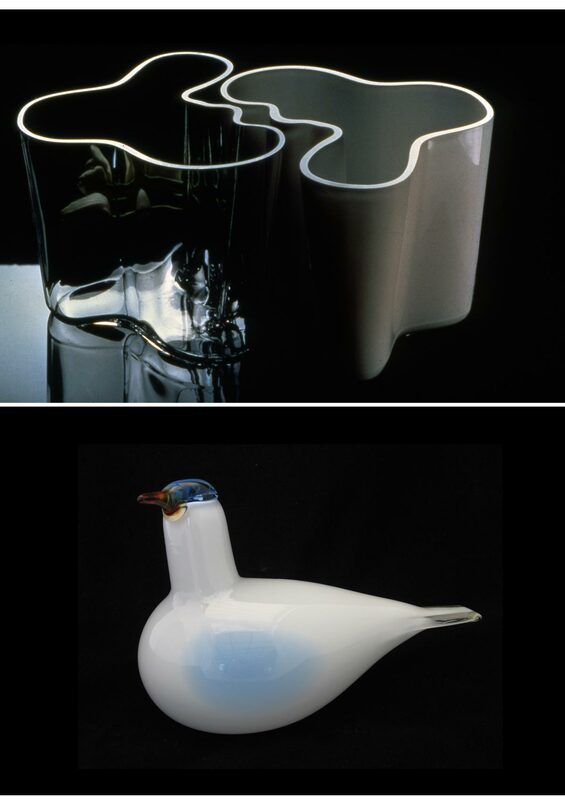 Bottom: Oiva Toikka’s glass dove (photo by Bridges Nichols). In Iceland, the concept of “hönnun” (design) steered the local craftsmen to create a design of their own. It reflected their dynamic island, blessed by breath-taking white glaciers and terrifying volcanic activity. The contrast of the harsh weather conditions was the inspiration for makers to thrive with shapes, textures, and patterns, combined with the need to survive the cold climate. Iceland has a strong presence in natural fiber textiles, especially knitted and felted items made from wool. Faith and folklore plays a huge role in Icelandic design, as seen in their intricate ceramics, wool fabrics, and metal carvings to this day. In Norway, simplicity of form and uncompromised durability were the goal of each design, integrating local craftsmanship all throughout the process. Stark colours mixed with contrasting patterns create a quiet aesthetic. Designers celebrate the strong, minimal aesthetic of wood, highlighting the material’s natural textures with its flexibility, such as seen in Hans Brattrud’s Scandia Jr chair. Another notable designer, Sven Ivar Dysthe, won the American Institute of Decorations International Award in 1959 with his black leather 1001. Dysthe was also an innovator of flat-packed furniture whose work can be alluded to as the earlier inspiration of Ikea. Norway’s designs have always focused on a strong minimalist aesthetic of beauty combined with functionality. In Sweden, minimalist, functional furniture with clean simple lines has always been the trend as well. Like other Nordic countries, a focus on functionality has incorporated a variety of modern materials as well as traditional, as shown in the 1950s when industrial designers began integrating colorful plastic furniture into the Nordic philosophy. Rational shapes have defined everyday life, such as the works of architect Bruno Matthson. Famous Swedish textile designer, Astrid Sampe, embraced the vivid colors and patterns that pervade Nordic design. Sweden is also home to Ikea, the internationally popular home furnishings company renowned for its simplified, do-it-yourself, flat-packed furniture. 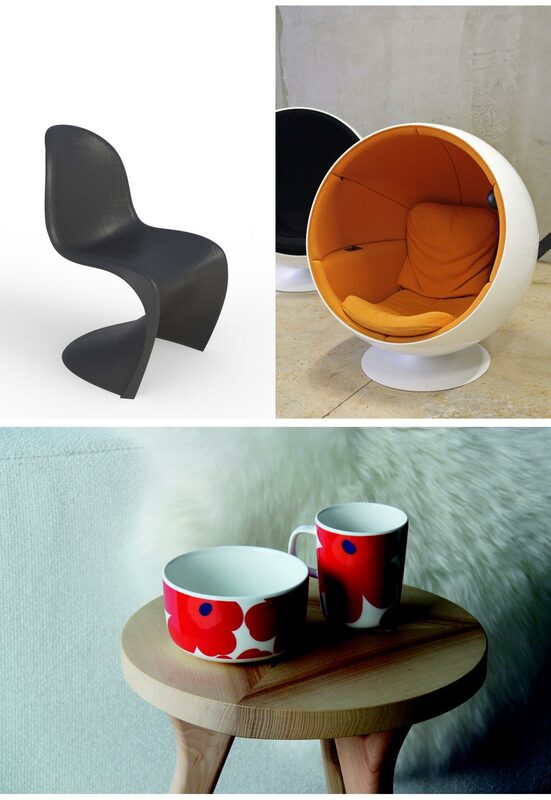 Through these contributions, Sweden has contributed greatly to the global fascination with Nordic design. 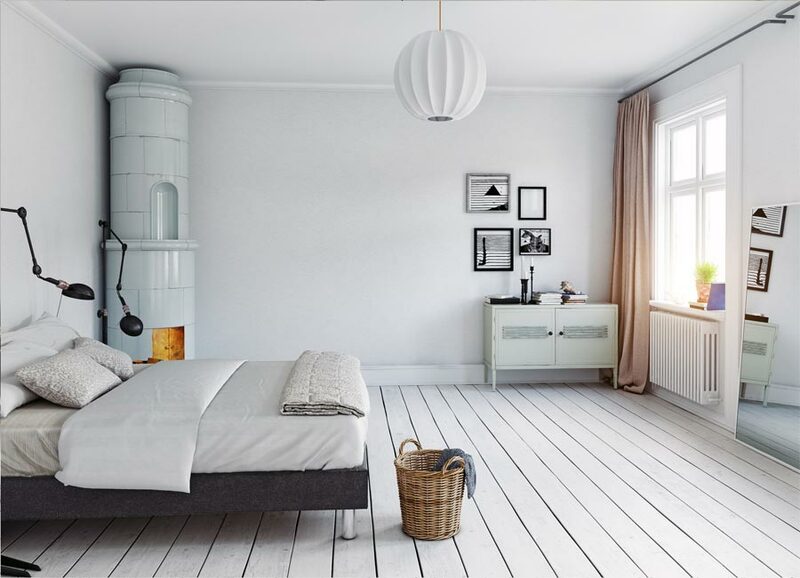 Modern bedroom with classic Swedish stove. Overall, Nordic design code relies on craftsmanship that is visually easy on the eye. Interiors make use of wood in warm, genial tones, softened with area rugs and palettes of cool, muted colors — perhaps a representation of their winter. 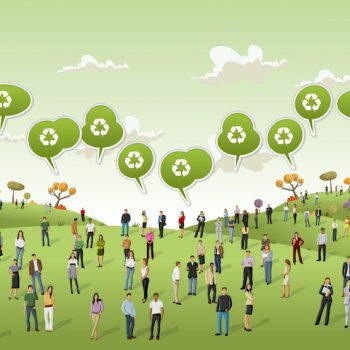 Smart interior surfaces, such as furniture and cabinetry, are crafted with eco-consciousness in mind. 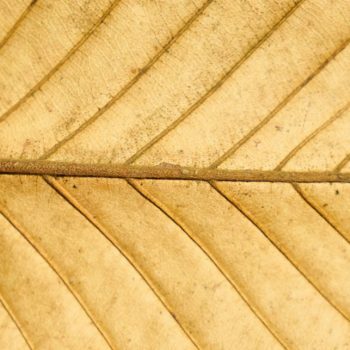 Sustainable building materials equip homes for longevity against harsh weather conditions. 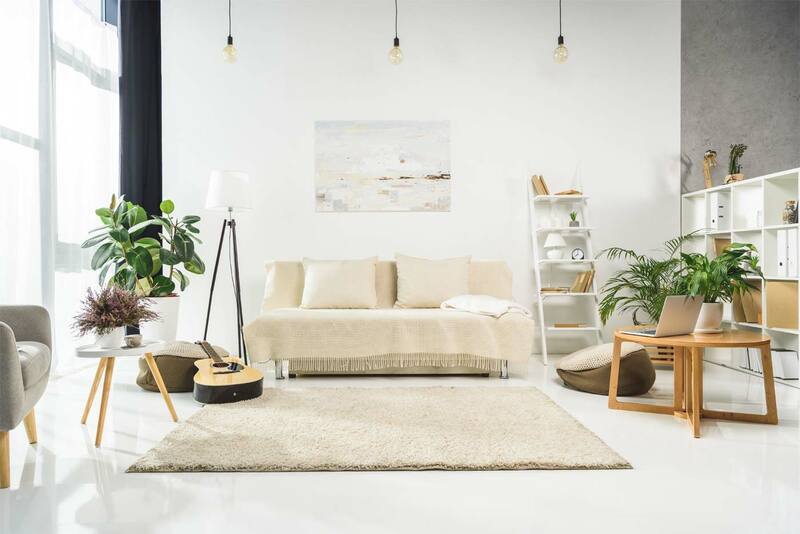 As for accessories, Nordic design thrives on the concept of “less is more.” Potted plants, white candles, and books for one’s reading pleasure accentuate the living room with function in mind. Less clutter, more function. Nordic design invites homemakers to let nature in through the rays of the sun, the timber, and the airiness of the space. The light colors invoke a pleasant mood indoors; the wood’s fine lines signify simple but meaningful poetry. Paired with furniture to last all seasons, families can indulge in modern comforts which are grounded and aesthetically pleasant.